On 20 February a small group of greenhouse horticulturalists and researchers visit the largest greenhouse horticultural fair in the Netherlands: Horticontact. The latest new techniques and materials in use in the sector were displayed. The most curious we were from Inagro was for the pre - and post harvesting techniques to use the residual waste streams valuable. The visit to the fair was organized from the Interreg 2 Seas project BioBoost. In this project, we bring entrepreneurs from the horticultural sector together to work together with them to identify where the needs are the innovations on the basis of tuinbouwreststromen to develop. A visit to the largest greenhouse horticultural fair with the last new techniques seemed to us an excellent opportunity to gain knowledge and make new contacts. To make waste valuable from the greenhouse horticulture, it is important to address pre - and post harvesting problems. For example, when emptying a tomato greenhouse at the end of the tomato season the ropes and clips are harvested together with the stems. The ropes and clips are unwanted items to make for example paper out of the fibres from these residual streams. But there are plenty of innovative alternative ropes and clips on the market which can make this valorisation possible. We were also very curious to see what the fair had to offer in this area. Many of the stakeholders within the project lined up at the start of the fair. Processors including Renewi responsible for processing/composting of leaves and Solidus, that use tomato fibres in the paper fabrication. In addition, machine builders including Weterings that makes foliage removers and companies with specialization in cultivation techniques such as Agrifast that produces the attachment clips and Lankhorst that makes different types of ropes for the market. On the picture you see a suspension system for a device that fixes metal tomato clips of Horti Ware. This unit is being tested by Inagro. Interestingly, there were a lot of companies that invest in innovation. There were quite a few providers of all types of led lighting. It is clear that led lighting is a growing market. 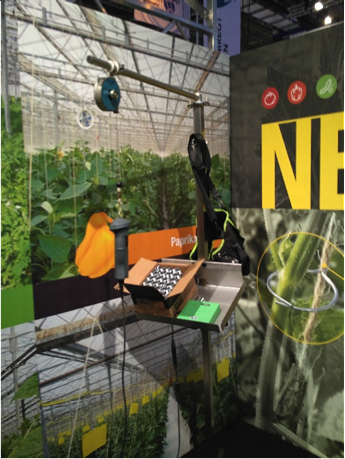 Both systems for use in greenhouses as for vertical farming were demonstrated. Netherlands also takes the lead in the area of deep geothermal energy. One uses deep geothermal energy already for the heating of greenhouses. For the geothermal systems is spoken of to have a Coefficient of Performance (COP) of 20 to 40. This is a measurement of how many kWh heat you get per kWh electricity that you insert into the system. This COP is quite impressive. A domestic geothermal system takes about a COP of 5.